Experience something different this week on the WELSTech Podcast, our first ever live show using Google Hangouts. Kicking the tires – As promised, this week’s podcast was kicked off in a Google Hangout, and we have video of the experience to share. Martin and Sallie were joined by listeners Perry Lund, Gail Potratz and Jason Schmidt as we tried out the platform, experiencing video chat, screen sharing, apps and more (hmmm … pirate Jason??). The audio of the session is integrated into this week’s podcast, but if you want to see the Hangout fun and not just listen, check out the archived video posted below. 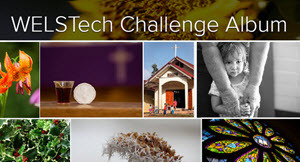 (31:01) Web sites done right – Mark and Lesley Bergemann, husband and wife webmasters at Good Shepherd’s in West Allis, WI, talk with Martin and Sallie about the communication strategy behind their church web site and updates they regularly make to support that strategy and track its effectiveness. Pastor Clint Rogas from St. Paul in Southhaven, WI is looking for a file and folder encryption and password protection utility. He’s checked out WiwRAR and jZip. Are there other suggestions? David Schumann from Peace in Janesville, WI shared a low-tech backup idea. A brand new e-book – For this month’s book discussion week Martin and Sallie turn to the pages of the Radian6 e-book How to Transform Your Small Business With Social Media. Listen as they discuss the first 4 chapters of this quick read, including the 3 R’s and 3 D’s of social media conversations. (32:22) FinalWeb training – This summer we’re offering online training on web site creation and maintenance using the FinalWeb system. And, for the first time, we’ll be using Google Hangouts! Perry Lund from Grace in Oskaloosa, IA shared a link to. Ryan Rosenthal from Faith in Fond du Lac, WI is looking for an social platform for church and school secretaries to share ideas. Any suggestions? (46:57) Episode 232 – Listeners are invited to join our LIVE WELSTech Google Hangout (about) to help us try out all the bells and whistles from 9:00 to 9:30 a.m. CDT next Tuesday, April 17. We’ll video the hangout and share it on our next show. This week on the WELSTech Podcast we countdown the 7 best e-mail productivity tools and tips. Taming the Inbox – Martin and Sallie share productivity tips and tools to manage the avalanche of e-mail we all have to deal with. (37:05) FinalWeb training – This summer we’re offering online training on web site creation and maintenance using the FinalWeb system. And, for the first time, we’ll be using Google Hangouts! Scanner recommendations – Martin recommends Fujitsu’s ScanSnap. Also listen to the archived PDFs and Potlucks WELSTech Podcast. Shelly Karstens from Peace in Hartford, WI shared a link presentations from the recent Wisconsin Educational Media & Technology Association (WEMTA). You can even watch and listen to an archived webinar about useful iPad apps for education.